Makeup Free Me – Photos! 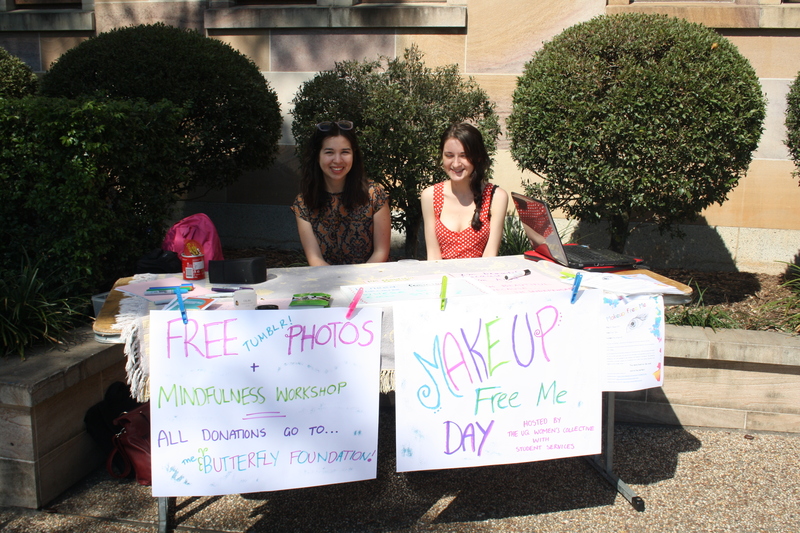 Our Makeup Free Me event turned out to be a great success for such a quiet day on campus! We took over 30 photos of women (and men!) going make up free and sharing something beautiful about themselves. We also raised $20 in donations for the Butterfly Foundation. 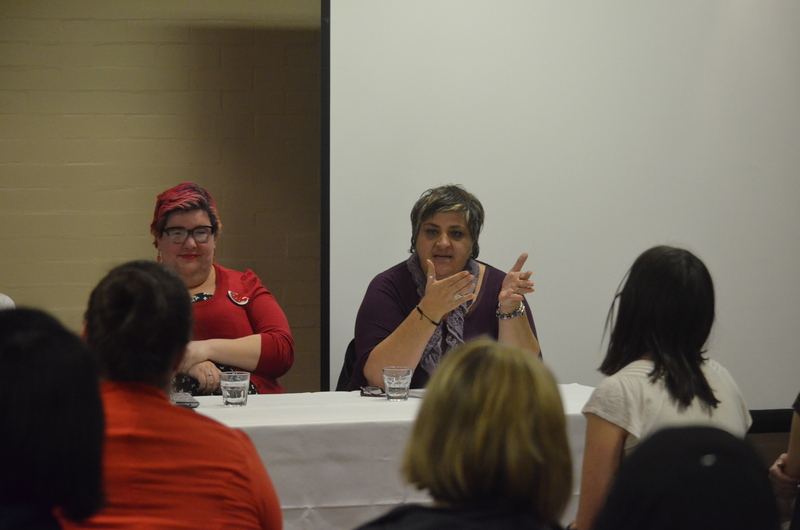 You can find all the photos at our tumblr (www.uqwomenscollective.tumblr.com). 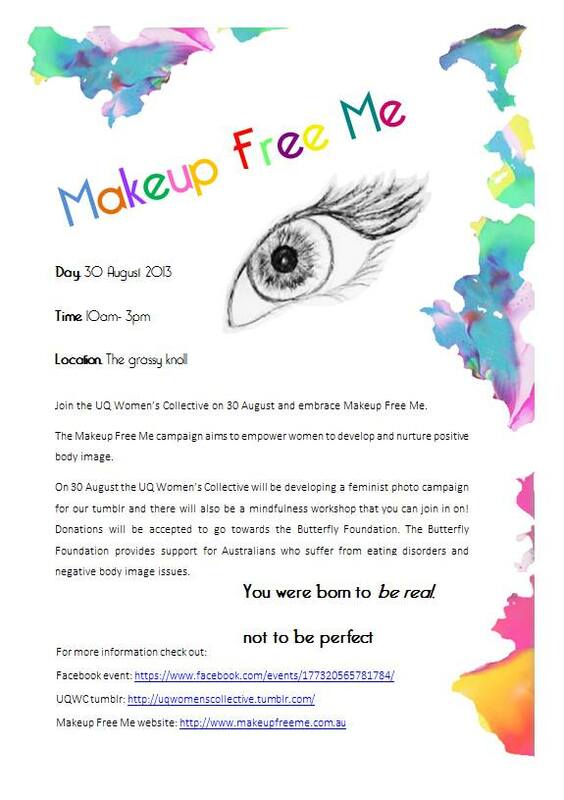 Makeup Free Me is an initiative started by Merissa Mathew in conjunction with the Butterfly Foundation asking young people, particularly young women, to go without make up to see how beautiful they can be in other ways. We spoke to Merissa about this great cause, where all donations are given to the Butterfly Foundation which supports those dealing with eating disorders and negative body image issues. She gave us some great words of wisdom to share! What is the Makeup Free Me challenge and what do you hope to achieve through this initiative? On Friday 30th August we are encouraging women all over Australia to take on the challenge of going without makeup for one day. By asking women to go makeup free for a mere 24 hours, we’re showing the world that beauty is more than just skin deep. At the same time we’re raising vital funds to support the Butterfly Foundation. The Butterfly Foundation provides support for Australians who suffer from eating disorders and negative body image issues and their carers. There’s a saying ‘be careful what you wish for’. In my case it was ‘be careful what you pray for’ because I said a desperate prayer one day asking for direction in my life and it was at that moment that this idea came about. Do you ever go without makeup? Prior to starting this campaign I never left the house without makeup on. In fact, when the campaign idea first came to mind I started laughing out loud but I released later that my own insecurities was what made me perfect for this venture. Since then I have gone out a few times without makeup on and its refreshing, freeing and scary all at the same time. I’m only now learning how to love me, the natural me. Any tips on embracing who you are and affirmations we can all try and remember for those times when we feel not so great? This is a great question. Positive self talk has always helped me. Sometimes speaking aloud all the great things about yourself or even writing them down can really boost your confidence. It may sound like a bizarre thing to do but this has honestly helped me in many aspects of my life, not just in relation to body image. 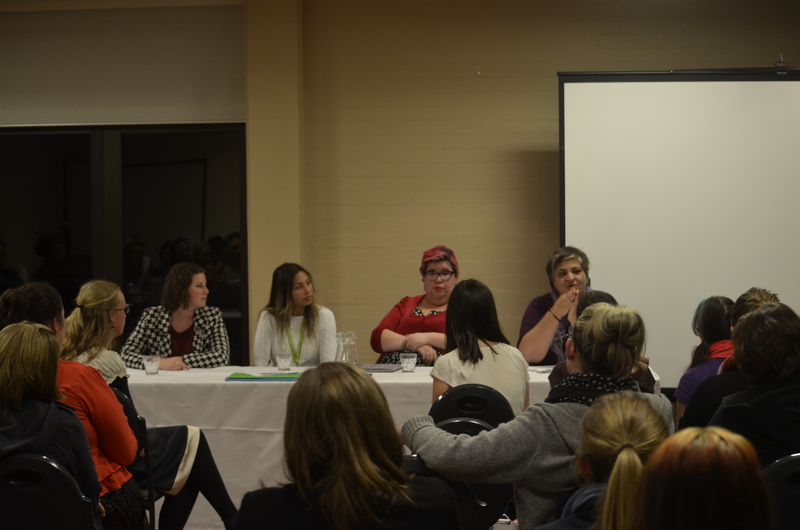 Do you have any personal stories to share around body image? I believe I’m like many women out there, I have good days and bad. Sometimes I feel great about how I look and other times I feel quite awful and the reality is that I don’t actually look any different. I know I personally place too much emphasis on the way I look and somehow I connect it with my self-worth. So in essence I’m far from having it all together and I’m very much on a journey in discovering my value in who I am rather than what I look like. Where do you see this campaign in a few years to come? 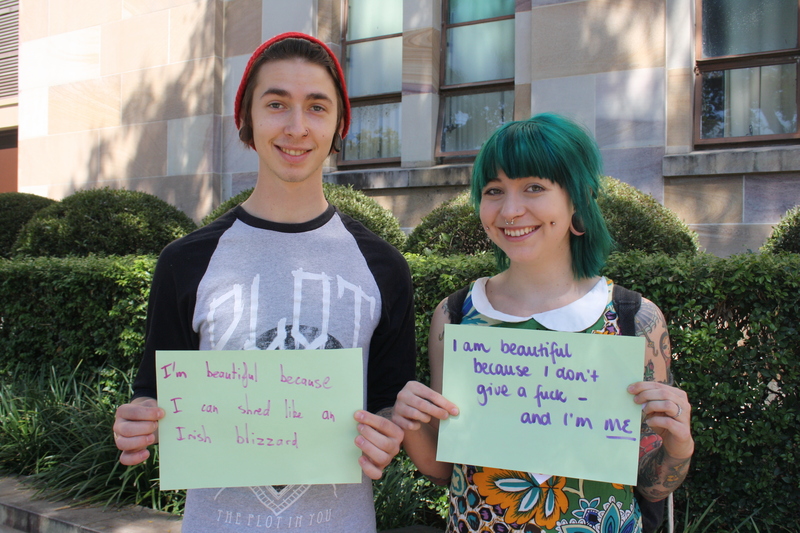 Negative body image is not just an issue in Australia. In fact, only 4% of women globally consider themselves beautiful. In a few years to come we hope to expand to other countries so that we can empower women across the world to develop and nurture positive body image. The UQWC is hosting a MUFM event this coming Friday at 10am on the Grassy Knoll on UQ St Lucia campus. We’ll be taking photos of you – you’re encouraged to not where any make up, but if you do that’s okay! We’ll get you to hold up a sign where you’ve written one thing you find beautiful about you that isn’t related to your appearance. Maybe it’s the way you support a friend in need, the way you stand up for yourself in stressful situations, or maybe the way you love your job or are doing the best you can in your studies. We’ll post the pics on our tumblr for your to see! Student Services will be hosting a Mindfulness workshop from 10-10.30am as well, so come along! A special shout out to Emily, Lotte and Emma who have all been a big help in organising our event! Embracing Our Bodies – Photos! 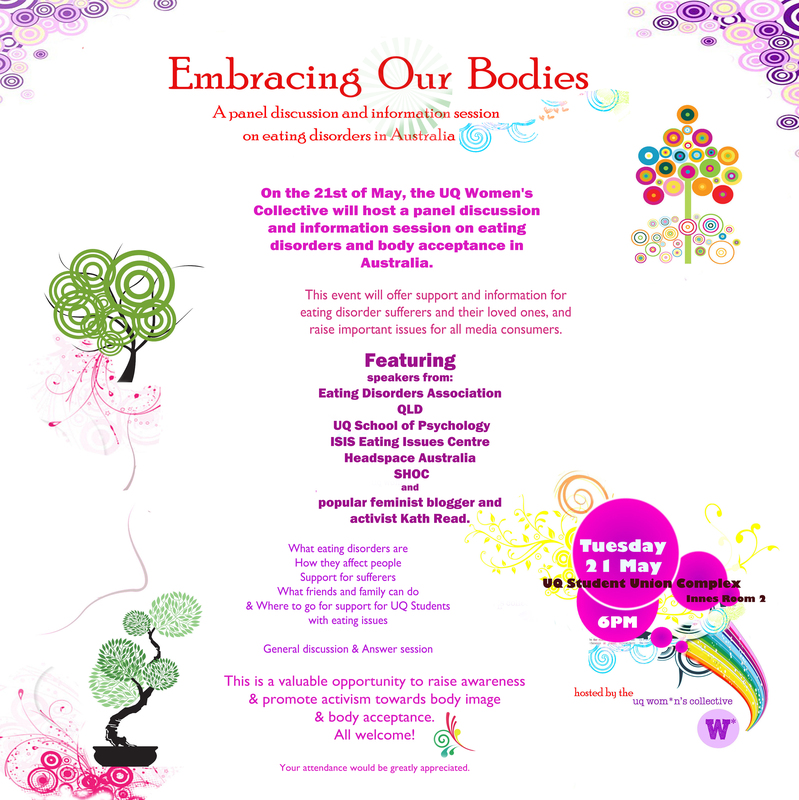 Here’s some happy snaps of the UQ Women’s Collective’s Diversity Week seminar on eating disorders and body image, ‘Embracing Our Bodies’. (You can find a recap and resources here). 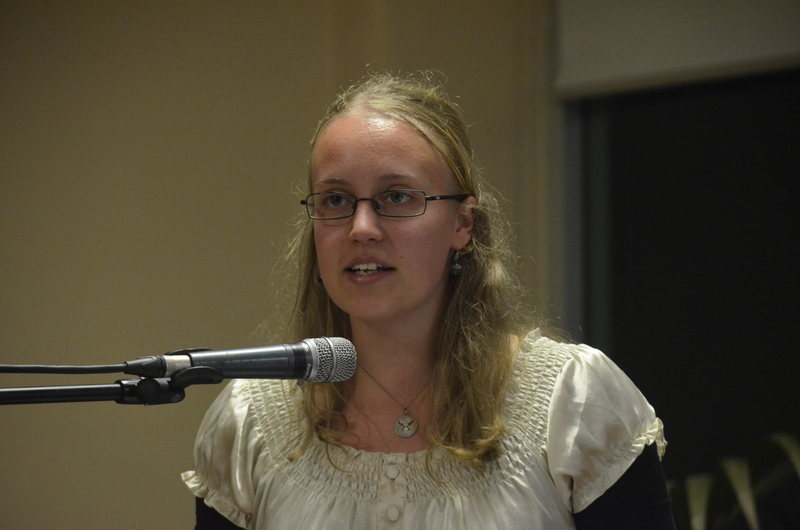 Thanks to Katie Douglass for letting us use her photos! 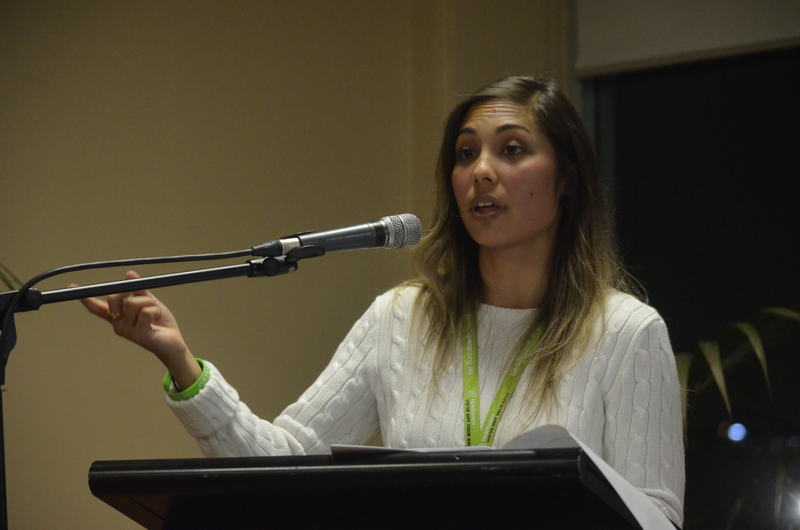 On Tuesday night the UQ Women’s Collective hosted a Diversity Week event called ‘Embracing Our Bodies‘, an information and discussion session about eating disorders and body image issues. Below are links to our amazing speakers’ organisations or blogs, along with some resources we made. You can find business cards and flyers from all the organisations featured at our seminar, along with Butterfly Foundation brochures, in the Wom*n’s Room on campus (Building 21A). Speaking of the Butterfly Foundation…they shared our event on facebook!! UQ campaigns or statements: light up the Forgan Smith purple for the Butterfly Foundation? Next Semester the UQWC will be trying to get a few of these ideas kick-started – hopefully the university will take some of them on board, too! Thanks once again to the Office of Undergrad Education for providing us with funding for our event. Happy Diversity Week!